So, at the suburban “blah” house, we have a colony of geckos living around the garage door. We’ve never tried to discourage them as they happily eat pretty much any bug that would otherwise be a household pest. 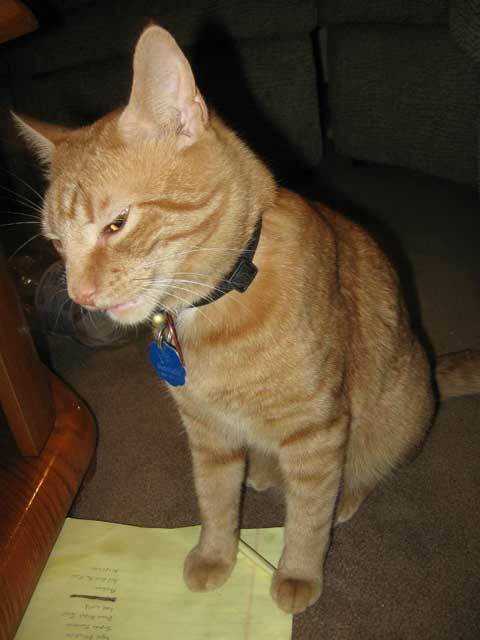 But we do have cats…and cats, particularly Geronimo, the big orange one, LOVE to hunt geckos. I don’t startle easily…and am generally not squeamish or easily freaked out…but there is just something odd about having the big orange cat drop a still wiggling gecko tail in your lap while you are sitting in shorts on the couch. Apparently, gecko tails detach easily as a defense mechanism for just these occasions. The detached tail wiggles for quite some time. Ten minutes after the first tail was dumped in my lap, here came Geronimo with another. I was able to catch this wiggly tail before he dropped it in my lap. The wife, ever more wise to these sorts of things, tells me that he does this because he likes me. “You’re probably like some sort of cat god to him.” she says. A god huh? A cat god. Ya know… ’cause it seems like just the sort of thing a cat-god would say, yes? That may have been a tactical error. Over the past days he has made good progress on obeying this somewhat ill-conceived commandment.